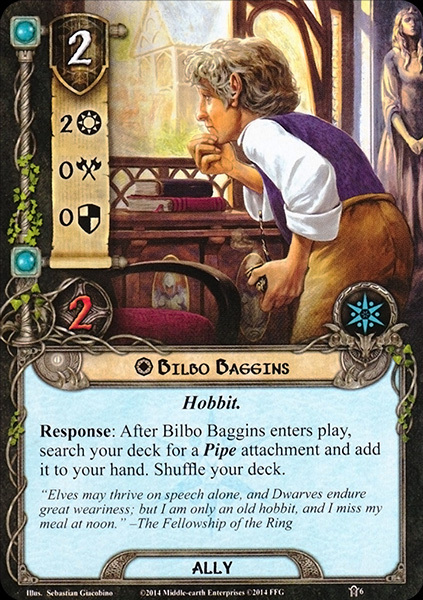 Before his adventures, Bilbo was considered a very prim and respectable Hobbit for his polite disposition and aversion to anything out of the ordinary. He had strict culinary and hygienic principles, being often less than thrilled with the rough conditions of travel at first. But, being the son of Bungo Baggins and Belladonna Took, Bilbo had blood from two important Hobbit families, the Bagginses and the Tooks. Because of his adventurous 'Tookish side' (which was sometimes conflicting with his stay-at-home 'Baggins side'), Baggins was rather restless and 'strange' for a Hobbit. After his return from Erebor, he was regarded much less fondly than before by his fellow Hobbits, but paid them no mind. Though considering himself happily retired from adventures, he often left his home for many days to meet with old friends and strangers, including Dwarves. During his youth Bilbo attended several parties during which he loved to listen to Gandalf's stories about Dragons, Goblins and princesses and was impressed by the Wizard's fireworks. After the death of his parents, respectively in T.A. 2926 and T.A. 2934, he inherited Bag End. In the eyes of his neighbors, he originally seemed just like his father, a solid, sensible, unadventurous and respectable hobbit. But when becoming older he started to become 'strange' and often left his home for many days to meet with strangers, including Dwarves. Gandalf managed to address him on a morning, while he sat outside his hobbit-hole. He reluctantly asked Gandalf for tea next day. Indeed Gandalf came back, bringing thirteen Dwarves with him. First came Dwalin, followed by Balin, next were Fíli and Kíli, then Dori, Nori, Ori, Óin and Glóin, and at last Bifur, Bofur, Bombur, Thorin and Gandalf. The Dwarves remained in Bag End for supper and afterwards sang a song about the Sack of Erebor and explained the reasons for their unannounced coming: the Dwarves begun a quest to reclaim the Lonely Mountain (and its sizable hoard) from the Dragon Smaug and Gandalf had volunteered Bilbo to be the company's burglar. Even with the Dwarves' protests and Bilbo's feeble objections, Gandalf convinced Thorin that Bilbo was the right person. Thus the Hobbit became the fourteenth member of the Company which left the Shire in T.A. 2941. The next day, after assembling at the Green Dragon, the company's journey to the Lonely Mountain began. Thorin and company traveled through the Lone-lands along high hills and beside castles. After approximately one month, Gandalf disappeared. Oín and Gloín failed to make a fire during a rainy night, and Balin spotted a fire in the distance, which was rare in those regions, and sent Bilbo to investigate. 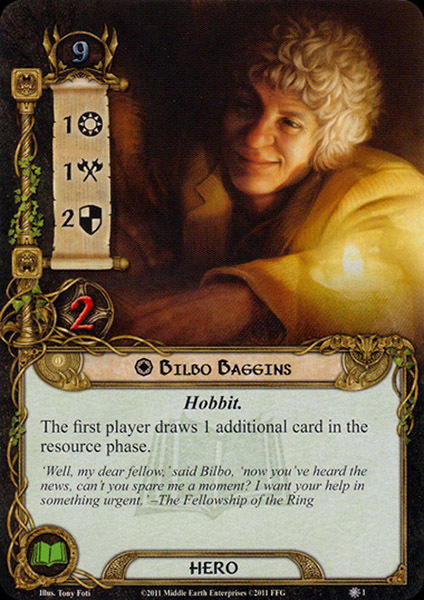 Bilbo won the contest by accident, wondering out loud as he fingered the ring he had picked up, 'What have I got in my pocket?' Gollum mistook this for a question, and Bilbo decided to stick to it. Gollum lost, but went back to his little island to take the ring Bilbo had picked up (as it was a magic ring) to turn himself invisible and kill the hobbit anyway. But of course the ring was not there, and Gollum, enraged, suddenly guessed that Bilbo had it. 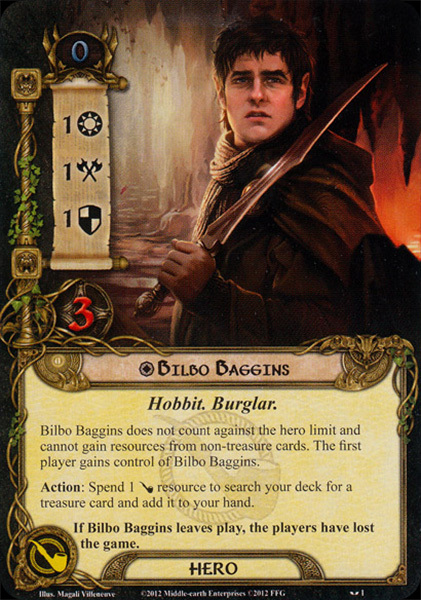 He chased Bilbo, but Bilbo unwittingly used the ring and escaped his notice. Gollum led Bilbo to the eastern door of the goblin-tunnels, through which Bilbo departed in safety. Soon after leaving the caves Bilbo found his companions and used the Ring to slip past Balin, the look-out. Balin was very impressed that he hadn't noticed Bilbo and his reputation among the dwarves increased. Bilbo told Gandalf and the dwarves about his encounter with Gollum and his escape, but he said nothing of the ring. Thus he rejoined his fellow adventurers. After many days' journey the company came to the Enchanted River. Bilbo noted that there was a boat at the other shore. Fíli threw an iron hook to grapple the boat and pulled it across the river toward them. The company crossed the river in pairs. While crossing the river, Bombur fell in. They rescued him, but he was asleep because of the river's magic and had to be carried on a litter. Eventually, the dwarves started to give up hope and sent Bilbo to climb a tree midway through the wood. Bilbo declared he could see only trees, not realizing they were at the bottom of a bowl formation. Giving up hope, the company noticed campfires of the feasting Wood-elves and, despite the warnings of Beorn and Gandalf, they left the road to contact the elves. However, whenever the company tried to contact them, they extinguished the fires, leaving a complete darkness in the forest, and disappeared suddenly. Thrice the dwarves tried to contact the Elves but all of their attempts failed. After their third attempt Bilbo lost his companions. Upon reaching the Long Lake, Bilbo, with the aid of Thorin, Fili and Kili, searched for the barrels with Dwarves and freed them. They then went to Lake-town, where they received a warm welcome. The Master of Lake-town invited Thorin and his companions to the feast he'd organized. Despite the feigned hospitality of the Master of Lake-town and his people Bilbo had an awful cold and could hardly say anything during the banquet. The company stayed two weeks in Lake-town. They were given new ponies and provisions for many days, and they were brought, by boat, to the northern tip of the Long Lake. At the very moment he heard a sharp crack behind him. There on the grey stone in the grass was an enormous thrush, nearly coal black, its pale yellow breast freckled with dark spots. Crack! It had caught a snail and was knocking it on the stone. Crack! Crack! Suddenly Bilbo understood. Forgetting al danger he stood on the ledge and hailed the dwarves, shouting and waving. “Well, thief! I smell you and I feel your air. I hear you breathe. Come along! Help yourself again, there is plenty and to spare!” But Bilbo was not quite so unlearned in dragon-lore as all that, and if Smaug hoped to get him to come nearer so easily he was disappointed. “No thank you, O Smaug the Tremendous!” he replied. “I did not come for presents. I only wished to have a look at you and see if you were truly as great as tales say. I did not believe them.” “Do you now?” said the dragon somewhat flattered, even though he did not believe a word of it. “Truly songs and tales fall utterly short of the reality, O Smaug the Chiefest and Greatest of Calamities,” replied Bilbo. “You have nice manners for a thief and a liar,” said the dragon. As darkness fell, Bilbo urged the dwarves to close the door for fear of Smaug's vengeance. Reluctantly, but at last, they gave in. Just as the door closed, Smaug ravaged the side of the mountain, blocking up the door and destroying the doorstep. However, by mentioning the word 'Barrel-rider', Bilbo had led Smaug to believe that the company had been aided by the people of Laketown. Thus, Smaug wreaked his vengeance on Laketown. Smaug destroyed the town, but one company of archers, led by Bard, resisted the dragon. When only one arrow, the Black Arrow, remained, a Thrush, who had overheard Bilbo talking about the unprotected patch of Smaug's skin, fluttered around Bard's shoulder. The Thrush passed his knowledge on to Bard who, armed with the knowledge, shot Smaug dead. Smaug fell onto the town, which was devastated by the dragon's attack, but Bard survived and swam to the shores of the lake. There, Bard, a heir of Girion of Dale, was proclaimed by the people to be king of restored Dale. Bard summoned Thranduil to help rebuild Laketown and Dale in return for part of the treasure. The armies of Mirkwood and Lake-town joined together and marched to the Lonely Mountain to take their share of the treasure. Meanwhile, in the Lonely Mountain, Bilbo and the dwarves decided to inspect the hoard while Smaug was away. During this time Bilbo stumbled across a gigantic and beautiful gem. Recalling an earlier conversation, Bilbo realized that it was the famous Arkenstone, but felt strangely reluctant to give it up. Instead, he put it in his pocket and continued on. After a song and gathering of treasure, Thorin gave Bilbo a beautiful coat of mithril as the first reward for his services. Thorin led the party to the front gate, and then Balin led them to the guardroom, where they sheltered. After Bilbo and his companions awoke the next morning they found that many birds, including the aforementioned Trush, assembled at the Lonely Mountain. Although the Thrush tried to say something to the company, none of them could understand him. Therefore the Thrush summoned the raven Roäc, who was able to speak Westron. Roäc told Bilbo and the dwarves about the events in Lake-town and told Thorin about the approaching armies. He counseled them to make peace with Bard and Thranduil, though it cost them dearly in gold. Thorin rejected this advice and announced that he would not share the treasure with anyone. Then, Thorin sent Roäc as a messenger to his nephew Dáin, lord of the Iron Hills, to request aid. The next days they made preperations and blocked the gate with a wall, while they received news from the ravens. The victors divided the treasure and Bard took Bilbo's fourteenth share of the gold and silver in return for the Arkenstone. Bilbo, despite having forfeited his share, was offered a rich reward but refused to take more than two small chests of gold and silver. When Bilbo and Gandalf bid farewell to Thranduil Bilbo gave him a necklace of silver and pearls. Thranduil gave the hobbit the title 'Elf-friend' and then he returned with Gandalf to the Shire. There he discovered that he was believed dead, and an auction was going on of his house and possessions. 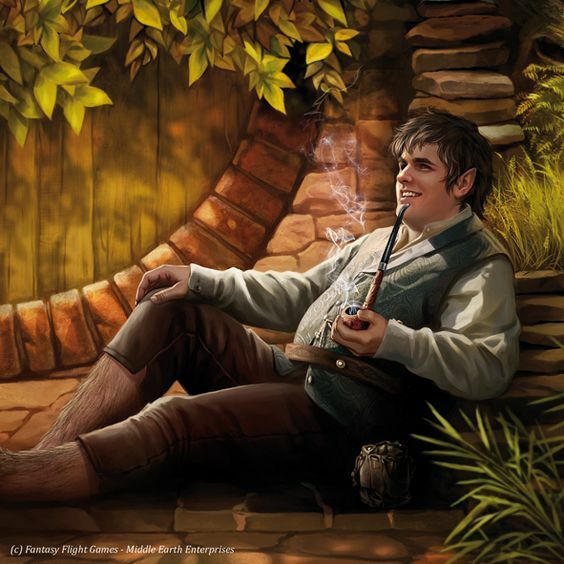 He bought back his own things, and settled once more peacefully into Bag End. Bilbo lived on in health and comfort, high in the regard of those who knew him best, but considered somewhat of an oddity. He adopted his young cousin Frodo Baggins as his heir, and raised him in Bag End. Occasionally he received visitors; dwarves, Gandalf, or even elves from time to time. Most of his time was spent reading, writing his memoirs, writing poetry, and avoiding his nasty relatives the Sackville-Bagginses. His life was extended by the ring (actually the One Ring of ancient history), and yet as he lived on with no apparent sign of aging, he began to feel stretched and thin. Within the legendarium, 'Bilbo' represents a translation of the original Hobbitish Bilba. John D. Rateliff has suggested that the name Bilbo is very likely a name invented by Tolkien, a 'short, simple, made-up name appropriate for a hero of a children's book or light-hearted fantasy story'. 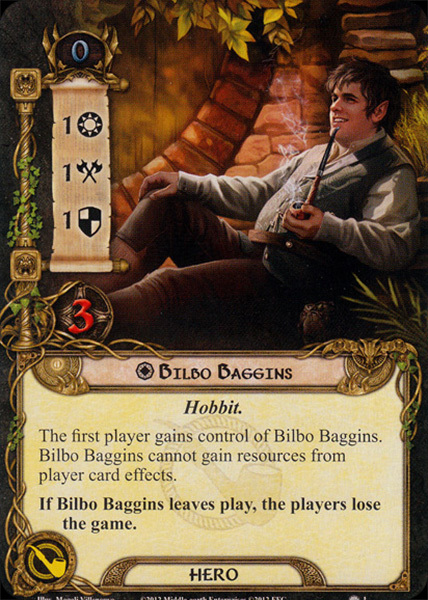 It has also been noted by Jim Allan that bilbo is a kind of Spanish sword deriving its name from Bilbao. The element bil 'sword' is found in some Germanic names (such as Bilihar).